as i mentioned a while back, josh and i recently ventured down to our alma mater, indiana university, in bloomington, indiana (in a massive snow storm, no less)... for a weekend of unhealthy food, copious amounts of beer and general tomfoolery. josh, pete, caylan & me... my three best boys. 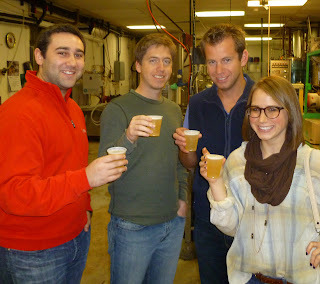 this was taken at bloomington's own upland brewing co., where we sampled several amazing beers. unfortunately, we did not eat here. i wish we had... their menu looks incredible! - yogi's grill & bar. so get ready, the chi city vegan goes to bloomington, indiana!